A new Hifiman planer headphone is quite common these days so the impact of a new arrival is perhaps a tad more muted than say the heady hurrah of the unboxing of the HE6. So with the release of the HE400 planer and the tempting low price of $399 you might be forgiven in thinking an easy to drive HE4 or perhaps a more cerebral HE300 but in actual fact you would be pretty wide of the mark. 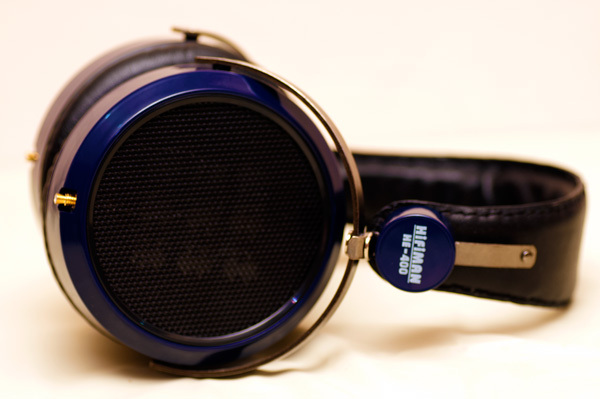 The HE400, in all its interesting blue glory, it quite possibly the first Hifiman planer that I could recommend to the “Beats” generation and have a good stab at winning the “bass” argument with this unyielding posse of consumer headphone merchants. Quite simply the HE400 bucks the trend of the previous planers and is built from the bottom up in terms of tonality instead of top down. It is not an analytical headphone and does take it’s cue from some of the warmer elements that have been creeping into Hifiman headphones over the last year but in every other respect this is a departure from the Hifiman house sound in a real big way for me. 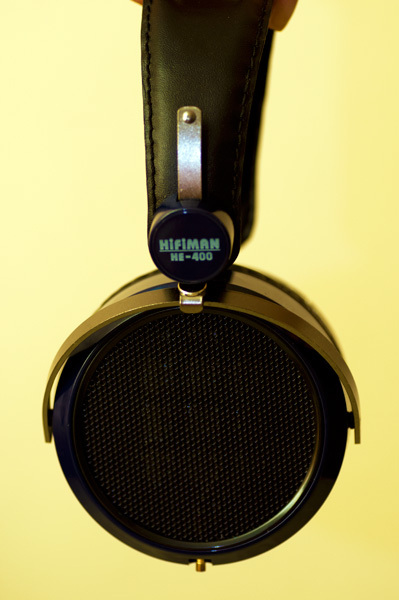 I often found myself in local meets having to push a Hifiman headphone under the noses of the K701 lover’s and the LCD-2 love-fest team and whilst they have all remarked that the Hifiman headphone is technically excellent they have never quite grabbed my fellow forum members in the same way as say an M50 (quite apart from the costs) and of course the historical power hungry needs of Hifiman planers has made it an even harder sell. The HE series did away with the power problem and gave a much easier to drive headphone but I will take the Pepsi challenge now and say the HE400 is the one that will grab a few by the ears and get them listening a bit more to what Hifiman can offer. I just wish it was not made in blue! Is there a black option? The $399 does come at the cost of some of the dressing though that was previously present. 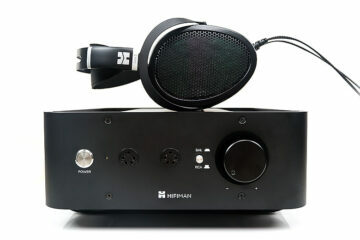 Gone is the decorative black box of previous Hifiman’s and in comes a more standard box type garden variety favored by the likes of Audio Technica. I can understand the thinking on this and it does seem economically sound but I did like those old elegant black boxes. Gone are the extra connectors and the extra pads also. Oh well its the headphone that counts and it is not as if the likes of AKG and Beyerdynamic have not released plain old vanilla boxes either for their mid-fi cans. The cables are once again Canare (HE300 stock also) and do play a big role in the darker sounding sq from the cans. As I write this we are in the middle of a batch recall of some sorts. Sadly the first batch of HE400 had driver issues in terms of how they were packed in the cups. The DIY fix is moderately simple and in fact I had to do that to both cups when they arrived being a first batch headphone but since then no issues. The initial problem was a loss of sound in one or both cups. Thankfully Hifiman have reacted with a new design second batch being worked on, an extended warranty on the HE400 for those who choose to keep theirs and if not a $150 upgrade to the HE500 which is by far their most popularly received headphone to date. Outside of that I am also not sure why it is blue to be honest. I just got used to the black casing in all variants and the silver for the dynamic HE300 then along comes the blue one. I would prefer it to be black but it is not the worst color in the world and I am getting used to it. Apart from the odd choice in color everything is business as usual in terms of design, fit and comfort. 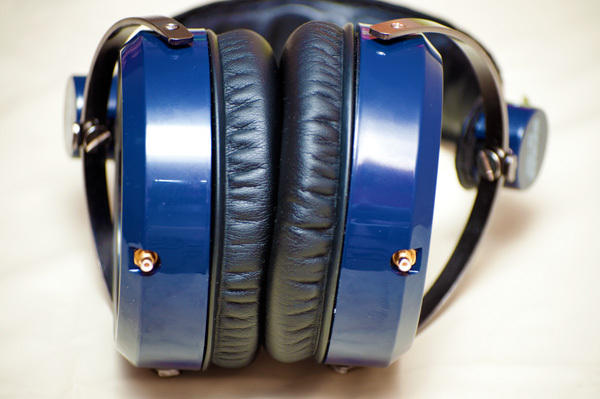 It is a slightly heavier headphone than the HE300, and about on par with the HE4 in terms of weight. The pleather pads are now as standard instead of the old velour pads with the improved locking system for taking them off and on and I must say I much prefer these over the velours; comfier, better isolation and contributes to a more solid and settled feel on my head. OK for a start this is not an HE500 or one of the high end planers. It is not the last word in detail, black background or nimble treble, but it has taken what the HE4 hinted at to it’s logical inclusion and went for musicality and fun in a big way. 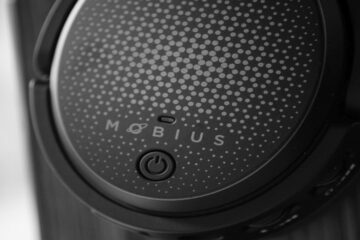 This headphone was tuned with bass in mind. Not bloated slow bass, but tight impactful bass with decent extension backed up by solid mids and clean treble that is in no way sharp or sibilant. The overall impression if that of a U-shaped frequency with emphasized bass and smooth but clear trebles though without any crazy recessed mids. Comparing this with the HE4 the improvements are very obvious. The mild v curve and sharp highes are replaced by a smoother response without any serious loss of clarity. The more forward tones of the HE400 are a step up from the HE300 and in many respects I found the presentation to be much more coherent and well thought out compared to the HE300. That is not to say it is a more balanced and neutral offering than the HE300, the tonality is anything but neutral but in every respect the sound is simply more convincing and confident in what it wants to achieve. The HE400, though smaller in sound stage than the higher up planners still retains a nice black background and better than average transients. Genre wise the tonality is now much more suitable for heavy hitting tracks such as dance, rock, R&B and the likes. The heavier hitting bottom end is entirely more satisfying. There is a loss of sound stage compared to the higher end planers by Hifiman and the dark tonality only adds to that closed feeling. I couldn’t help but smile though as I ran though my standard reference tracks such as Deadmau5’s ‘I remember” and The Cult’s ‘Lil’ Angle” with a raucous beat orientated undertone, clean highs and great control. The laid back nature of the upper mids gives an added sparkle to the high end that is so suitable for electronica but unlike the HE4 I didn’t find this fatiguing. I think my first listening session was 3 hours before I felt I needed a break. This was my standard setup for most of the main review. The scaling of the HE400 was pretty limited over smaller amps but I found the already impactful and aggressive Burson house sound to really match well with the HE400 tonality. 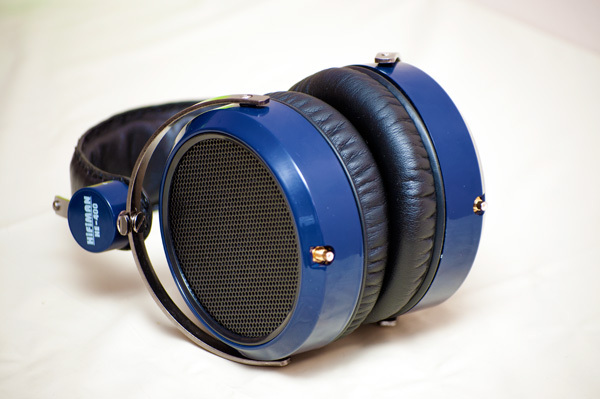 The Burson added plenty of zip and pop to the HE400’s mid bass and drove them pretty well without any loss of clarity. Though being relatively easy to drive I doubt though a Burson Audio HA-160 is the answer to your amping needs unless you already have one in your collection. Though rating at 35ohms I preferred the high impedance jack socket over the low impedance. The planer really does need just a little more control volume wise and the low impedance jack just didn’t cut it. This is still not dynamic easy to drive territory just yet in some respects. On flat EQ it’s not as punchy as the Burson Audio HA-160 but then that would have been an impressive feat if it could. The E17 brings its own unique flavor to play with a slight downplay of the bass (read slight folks) and a more airy tone to vocals. The HE400 still retains its dark tonality but its not as visceral as out of the HA-160. Perhaps even a bit laid back. Enter the EQ equation of the e17 and any issues you have with impact can be solved right there. Sticking the bass up to 6 was more than enough for me – more low end than even the Burson when eq’ed. The sound was very thick and bassy though and for most discerning audiophiles probably an affront to nature but the closet basshead in me couldn’t help but giggle. I really admire the E17’s capabilities when merged with the E9 to add something over and above the stock sound when required. Much better than I expected. I initially thought the power might be too much but the HE400 warmed to the task quite well. The bass presentation is back to being tight and punchy and less bloated than on the e9/e17 (eq version) but maybe not as impactful as the Burson HA-160. The Burson is one tough nut when it comes to aggression and made my Lyr seem a tad polite by comparison using the HE400. The Lyr did bring out the highs and injected a little bit more articulation than the previous two with slightly more defined sound stage. I kind of missed the fun factor of the Burson after coming off the Lyr but this is way more accurate than the E9 and E17. The world’s most powerful portable amp and most suitable for ortho on the run so they say. Though not in the same league as say a Burson or even a Lyr the PB2 did pretty well with the HE400 but the SQ IMHO was quite different – mush sparkier in the highs and much less extension in the bass and a small bass hump. The thickness of the sound was also gone a little also in comparison to the table top setups. Overall my impression of the Pb2 was something of cleaner more agile presentation than the e17 and E9 but lacking the oomph of the Burson. I really enjoyed the HE400 more than I thought I would. I rate it the most consumer-centric headphone to date from Hifiman and one I would happily bring to forums and say try that with electronica. No sharp highs, plenty of deep impactful mid-bass and clean mids. It’s not a class leader of any sorts but it brings the unique ortho sound to the masses in a way I think most would rate quite highly and may even dump their ‘beats’ for one (I hope!). Hey I just got my HE400 and was wondering why they sound so closed when I had a friend’s HE6 to compare with. After switching around to a different set of pads (velour ones, instead of the stock pleather ones), the sound changes quite drastically – there is slightly less mid-bass, but much better clarity and open-ness to the sound. Thus the earpads would probably have contributed to the difference between the sounds of the HE400 and HE500. Might you test switching the earpads and see whether this holds true? Actually Hifiman cans used to come stock with velour instead of the leather or pleather pads and people used to complain they were too bright hence they made leather for those who wanted added bass and a more closed or toned down top end. I used to have velour only before then and whilst it has admirable qualities my preference was for the pleather and I can assure you that what you are experiencing is quite true though if underpowered the treble can sound a bit too piercing. So, who is the class leader? Hi Anders and thank you for visiting us – could you be more specific on class leader? Company or headphone? I love those he400s too. I also had a feeling that the slightly forward Burson mids would be a good match for the laid back mids of the he400.